Jean-Christophe Bott has been steadily honing his style over the past several years. It is safe to say that now, he is one of the most dynamic, intuitive and sensitive wine growers in France. Fully invested, both emotionally and intellectually in biodynamic farming, the results are beginning to show in the wines that he produces. 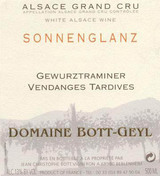 The crystaline view that his wines provide of the various vineyards and sites can be very enlightening as one digs deeper seeking the essence and soul of Alsace.